Kalanchoe (Kalanchoe): growing, planting, caring. kalanchoe is a genus of about 125 species of tropical, succulent flowering plants in the family Crassulaceae, mainly native to Madagascar and tropical Africa. A genus difficult to describe, as it varies from one species to another. These are usually indoor evergreen, fleshy, decorative, and very colorful flowering plants. Kalanchoes are cultivated as ornamental houseplants and rock or succulent garden plants, and they’re very popular because of their ease of propagation, low water requirements, and wide variety of flower colors typically borne in clusters well above the phylloclades. Most of the kalanchoes grown are perennial and herbaceous, but there are 200 species, some annual, others biennial, some shrubs. The leaves are toothed, opposite or compound and pennatized, sometimes pinnate, very rarely arranged alternately or whorled. The flowers open during the day, are composed of four lobes and they are organized in panicles at the top of the stems. Kalanchoees measure between 15 and 150 cm. Plant your kalanchoe in a pot in spring, in potting soil or decomposed compost mixed with sand, on a layer of non-calcareous gravel. Some advise to add peat, but peat bogs are non-renewable protected areas, so it's up to you ... Place the kalanchoe in bright, non-burning light. For kalanchoe planted in open ground, place them in partial shade, in a very drained soil, rich in humus. Kalanchoe do not like limestone, so use filtered water instead. During growth, one watering per week is enough. In winter it is necessary to space watering more than 10 days. Renew the soil of your Kalanchoees every two years. Use a bigger pot if you can. Depot them, prune the outer roots and replace them with decomposed potting soil and sand. If you do not have a bigger container or your kalanchoe is too big, just replace the mixture on the top of the soil. From mid-May, do not hesitate to take out your kalanchoe to strengthen it. Place the pot in partial shade, or plant it in a well-drained, humus, non-calcareous soil. As soon as temperatures drop below 10 ° C, bring in your kalanchoe and put it in the light. 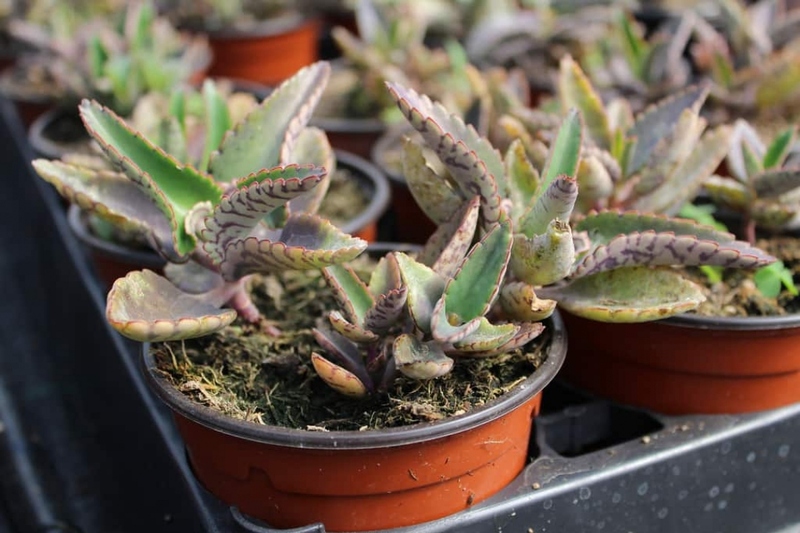 Do you see damages to your kalanchoe? In the first place, suspect an excess of moisture or limestone. Indoors, the aphids and mealybugs feed on them, you can make them fall with a mixture of black soap.